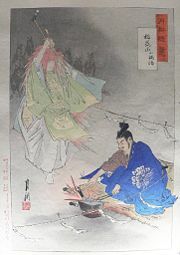 Inari and her fox spirits help the blacksmith Munechika forge the blade ko-kitsune-maru (Little Fox) in the late tenth century. This legend is the subject of the noh drama Sanjo Kokaji. Inari (Japanese: 稲荷; also Oinari) refers to the Japanese kami (deity) of fertility, rice, agriculture, foxes, industry, and worldly success. A popular figure in both Japanese Shinto and Buddhist beliefs, Inari can be represented as male, female, or androgynous, and is even sometimes conceived of as a collective of three or five individual kami. Inari has multivalent roles in Japanese culture: the deity is responsible for worldly prosperity including all aspects of finance, business, and industry. It is sometimes worshipped as a deity of luck, and women, correspondingly, pray to it to grant them children. Additionally, Inari is the patron of blacksmiths, the protector of warriors, a protector of fishermen, and preventer of fires. The deity also became the patron of actors and of prostitutes, since its shrines were often found near the pleasure quarters where these individuals lived. Inari is petitioned for good health and is credited with curing such diverse afflictions as coughs, toothaches, broken bones, and syphilis. Due to these multivalent personalities and abilities, Inari became a popular Japanese deity with shrines and temples located throughout most of Japan. According to a 1985 survey by the National Association of Shinto Shrines, 32,000 shrines—more than one-third of Shinto shrines in Japan—are dedicated to Inari. The origin of Inari worship is not entirely clear for the name Inari does not appear in classical Japanese mythology. The first recorded use of the present-day kanji (characters), which mean "carrying rice," was in the Ruijū Kokushi in 827 C.E. Other sets of kanji with the same phonetic readings, most of which contained a reference to rice, were in use earlier, and most scholars agree that the name Inari is derived from ine-nari (growing rice). The worship of Inari is known to have existed as of 711 C.E., the official founding date of the shrine at Inari Mountain in Fushimi, Kyoto. Scholars such as Kazuo Higo believe worship was conducted for centuries before that date; they suggest that the Hata clan began the formal worship of Inari as an agriculture kami in the late fifth century. By the Heian period, Inari worship began to spread. In 823 C.E., after Emperor Saga presented the Tō-ji temple to Kūkai, the founder of the Shingon Buddhist sect, the latter designated Inari as its resident protector kami. In 827 C.E., the court granted Inari the lower fifth rank, which further increased the deity's popularity in the capital. Inari's rank was subsequently increased, and by 942 C.E., Emperor Suzaku granted Inari the top rank in thanks for overcoming rebellions. 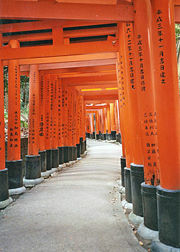 At this time, the Fushimi Inari shrine was among the 22 shrines chosen by the court to receive imperial patronage, a high honor. The second Inari shrine, Takekoma Inari, was established in the late ninth century. Inari's popularity continued to grow. The Fushimi shrine, already a popular pilgrimage site, gained wide renown when it became an imperial pilgrimage site in 1072 C.E. By 1338 C.E., the shrine's festival was said to rival the Gion Festival in splendor. In 1468 C.E., during the Ōnin War, the entire Fushimi shrine complex was burned. Rebuilding took about thirty years; the new building was consecrated in 1499 C.E. While the old complex had enshrined three kami in separate buildings, the new one enshrined five kami in a single building. The new shrine also included a Buddhist temple building for the first time, and the hereditary priesthood was expanded to include the Kada clan. During the Edo period, Inari worship spread across Japan; it became especially prominent in Edo. Smyers attributes this spread to the movement of daimyo (feudal lords). Inari had by the sixteenth century become the patron of blacksmiths and the protector of warriors—for this reason, many castle compounds in Japan contain Inari shrines—and the daimyo took their belief in their protector kami with them when they relocated to a new domain. Inari's divine role continued to expand; on the coast, he became a protector of fishermen; in Edo, he was invoked to prevent fires. He became the patron of actors and of prostitutes, since his shrines were often found near the pleasure quarters where these individuals lived. He began to be worshipped as the "Desire-Fulfilling Inari," a deity of luck and prosperity; a common saying in Osaka was Byō Kōbō, yoku Inari (For sickness [pray to] Kōbō, for desires [pray to] Inari). Ironically, Inari also began to be petitioned for good health; he is credited with curing such diverse afflictions as coughs, toothaches, broken bones, and syphilis. Women also prayed to Inari to grant them children. After a government decree mandated the separation of Buddhist and Shinto beliefs, many Inari shrines underwent changes. At Fushimi Inari, for instance, structures that were obviously Buddhist were torn down. Among the populace, however, the blended form of worship continued. Some Buddhist temples maintained Inari worship by arguing that they had always been devoted to a Buddhist deity (often Dakiniten), which had been perceived by the common folk to be Inari. In the Tokugawa period, when money replaced rice as the measure of wealth in Japan, Inari's role as a kami of worldly prosperity was expanded to include all aspects of finance, business, and industry. At the beginning of the eighteenth century, followers of Inari at the Ginza mint struck coins meant for offerings to Inari, which featured pictures of two foxes and a jewel or the characters for "long life" and "good luck." In Japanese art, Inari has been depicted both as male and as female. According to scholar Karen Ann Smyers, the most popular artistic representations of Inari are an old man carrying rice, a young female food goddess, and an androgynous bodhisatva. The preferred depiction of gender varies according to regional traditions and individual beliefs. Inari's female aspect is often identified or conflated with Dakiniten, a Buddhist deity who is a Japanese transformation of the Indian dakini, or with Benzaiten of the Seven Lucky Gods. Dakiniten is portrayed as a female or androgynous bodhisatva riding on a flying white fox. Because of Inari's close association with kitsune, the kami is sometimes portrayed as a fox; although this belief is widespread, however, both Shinto and Buddhist priests discourage it. Inari also appears in the form of a snake or dragon, and one folktale has him appear to a wicked man in the shape of a monstrous spider as a way of teaching him a lesson. Inari is sometimes identified with other mythological figures. Some scholars suggest that Inari is the figure known in classical Japanese mythology as Ukanomitama or the Kojiki's Ōgetsu-Hime; others suggest Inari is the same figure as Toyouke. Some take Inari to be identical to any grain kami. Inari is often venerated as a collective of three deities (Inari sanza); since the Kamakura period, this number has sometimes increased to five kami (Inari goza). However, the identification of these kami has varied over time. According to records of Fushimi Inari, the oldest and perhaps most prominent Inari shrine, these kami have included Izanagi, Izanami, Ninigi, and Wakumusubi, in addition to the food deities previously mentioned. The five kami today identified with Inari at Fushimi Inari are Ukanomitama, Sadahiko, Omiyanome, Tanaka, and Shi. However, at Takekoma Inari, the second-oldest Inari shrine in Japan, the three enshrined deities are Ukanomitama, Ukemochi, and Wakumusubi. The fox and the wish-fulfilling jewel are prominent symbols of Inari. 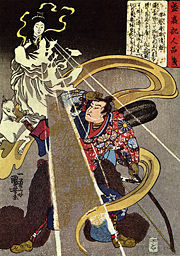 Other common elements in depictions of Inari, and sometimes of his kitsune, include a sickle, a sheaf or sack of rice, and a sword. Red torii along a path at the Fushimi Inari Shrine. Inari is a popular deity with shrines and temples located throughout most of Japan. According to a 1985 survey by the National Association of Shinto Shrines, 32,000 shrines—more than one-third of Shinto shrines in Japan—are dedicated to Inari. This number includes only Shinto shrines with full-time resident priests; if small roadside or field shrines, shrines kept in a home or corporate office, smaller shrines without full-time resident priests, and Buddhist temples were included, the number would increase by at least an order of magnitude. The entrance to an Inari shrine is usually marked by one or more vermilion torii and some statues of kitsune, which are often adorned with red yodarekake (votive bibs) by worshippers out of respect. This red color has come to be identified with Inari, because of the prevalence of its use among Inari shrines and their torii. The main shrine is the Fushimi Inari Shrine in Fushimi, Kyoto, Japan, where the paths up the shrine hill are marked in this fashion. The kitsune statues are at times taken for a form of Inari, and they typically come in pairs, representing a male and a female. These fox statues hold a symbolic item in their mouths or beneath a front paw—most often a jewel and a key, but a sheaf of rice, a scroll, or a fox cub are all common. Almost all Inari shrines, no matter how small, will feature at least a pair of these statues, usually flanking or on the altar or in front of the main sanctuary. The statues are rarely realistic; they are typically stylized, portraying a seated animal with its tail in the air looking forward. Despite these common characteristics, the statues are highly individual in nature; no two are quite the same. Offerings of rice, sake, and other food are given at the shrine to appease and please these kitsune messengers, who are then expected to plead with Inari on the worshipper's behalf.. Inari-zushi, a Japanese sushi roll of packaged fried tofu, is another popular offering. Fried tofu is believed to be a favorite food of Japanese foxes, and an Inari-zushi roll has pointed corners that resemble fox ears, thus reinforcing the association. Priests do not normally offer these foods to the deity, but it is common for shops that line the approach to an Inari shrine to sell fried tofu for devotees to offer. 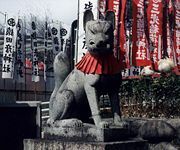 Fox statues are often offered to Inari shrines by worshippers, and on occasion a stuffed and mounted fox is presented to a temple. At one time, some temples were home to live foxes that were venerated, but this is not current practice. Inari's traditional festival day was the first horse day (the sixth day) of the second month (nigatsu no hatsuuma) of the lunisolar calendar. In some parts of Kyūshū, a festival or praying period begins five days before the full moon in November; occasionally it is extended to a full week. This is accompanied by bringing offerings of rice products to a shrine to Inari each day and receiving o-mamori (protection charms). The festival is particularly popular in the countryside near Nagasaki. ↑ Shōji Okada. "Reii-jin to Sūkei-kō." Nihon Shūkyō Jiten (1985), 73-80. ↑ Lafcadio Hearn. Glimpses of Unfamiliar Japan. Project Gutenberg e-text edition, (2005), 152-153. Retrieved on February 19, 2007. Higo, Kazuo (ed. ).Inari Shinkō no Hajime. Tokyo: Yūzankaku Shuppan, 1983. Ono, Yasuhiro, (ed.). Nihon Shūkyō Jiten. Tokyo: Kobundo, 1985. Naoe, Hiroji. (ed.) Inari Shinkō. (Tokyo: Yūzankaku Shuppan, 1983. This page was last modified on 28 February 2018, at 19:28.